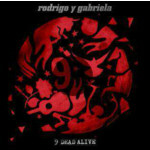 9 Dead Alive sees Rodrigo y Gabriela playing face to face, guitar versus guitar, bursting with melodic energy and rhythmic invention. Gabriela's enduring touchstones - animals and nature. The bonus DVD features behind the scenes making of the record, turtorial videos and interviews.